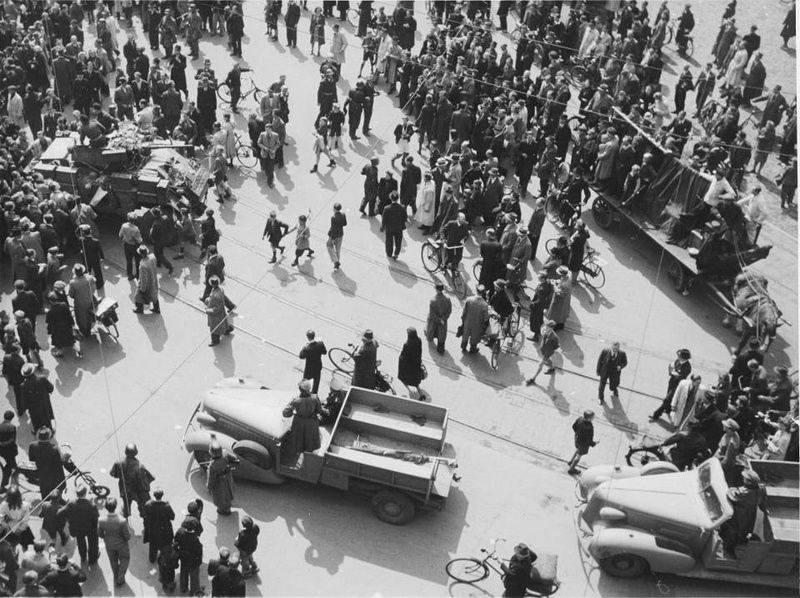 Thousands of people are gathered on the Dam Square in Amsterdam awaiting the arrival of the liberators. Around 1 p.m. a number of allied tanks arrive via Rokin on Dam Square. They are the Reconnaissance unit of the British 49th (West Riding) Infantry Division nicknamed the Polar Bears. The armoured vehicles are soon filled with celebrating people. A number of German vehicles approach from the opposite direction. The 2 groups pass each other in front of the Nieuwe Kerk (‘New Church’) and a tense moment arises. Although the Germans drive away, the British realise how explosive the situation is and depart again via Rokin. Photo: Wiel van der Randen, Nationaal Archief / Spaarnestad Photo. For a while things seem to have settled down. However, at 3 p.m. shots are fired from behind the Palace on the Nieuwezijds Voorburgwal and soon the whole tinderbox ignites. The Binnenlandse Strijdkrachten (‘Dutch Domestic Armed Forces’) are firing from the Dam Square, while the German Kriegsmarine soldiers are firing back from within the Grote (‘Big) Club. Panic erupts and the revellers are desparately jostling to get away. In the mean time, a second salvo of shots occurs. Scouts, Red Cross workers and nurses who had all been present on Dam Square, are now attending to the victims. The shooting continues for one and a half hours until Major Overhoff of the Binnenlandse Strijdkrachten aided by the German Hauptmann Bergmann manages to establish a ceasefire between the 2 parties. This is at least one of the stories. It is also possible that the shooting ended after the threat of grenades being launched from bazookas by the Binnenlandse Strijdkrachten in the Palace towards the Germans in the Grote Club. On May 9th1945 the German soldiers were rounded up by the Canadians from the Grote Club and transported to Germany. The motive behind the shooting was never been investigated and the perpetrators were never been prosecuted. It was always assumed that there had been 19 to 22 fatalities, but it was never known who they were. Currently we are trying to find the names of the victims and to add their faces and stories to our website with the help of their relatives. The final target is to reveal a Memorial with their names on May 7th, 2015 which will be 70 years after the event took place. From that moment onwards, everyone will know who these people were. At the moment we have been able to find 32 victims, but there were more fatalities of which we are not sure whether they were genuine ‘Dam” victims. We have placed a request for any living relatives on our research page. Known details of ‘proven’ victims can be found on the overview page. Further on, we are also trying to gather any other relevant information on this website. This includes possible testimonies, newspaper articles, forgotten material regarding the Binnnlandse Strijdkrachten and photos taken by photographers who had been present at the event. Any material like testimonies, newspaper articles etc has not been edited and we have endeavoured to acknowledge any known sources. We apologize sincerely in case someone was overlooked and would appreciate it if you could notify us of such discrepancies via email. Any other testimonies came about through the efforts of the members of our project team. These statements are not allowed to be reproduced without our permission. Stichting Memorial 2015 voor Damslachtoffers 7 mei 1945 (‘Foundation Memorial 2015 for Dam victims 7 May 1945’) was set up specifically for this investigation. We are much obliged if you want to support us for our investigation and website.